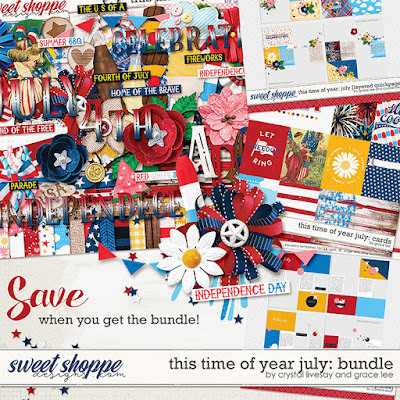 This Time of Year July: Bundle is inspired by patriotic celebrations, fireworks, picnic, bar-b-ques and family fun. Document your red, white and blue summer events with this wonderful collection's bright colors and sunny elements. Besides the kit and journal cards, this collection includes a set of templates and a set of quick pages, made specifically for pocket albums, and your everyday moments. These templates come complete with journal and photo prompts and lots of photo spots. Th quick pages come with readymade clusters and journal cards that make completing a yearly project so easy. Use the prompts as is for guided memory keeping throughout the next year, or delete the journal layers and journal about photos from previous years.